To find out why particular materials obey Ohm’s law, we must look into the details of the conduction process at the atomic level. 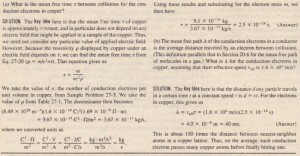 Here we consider only conduction in metals, such as copper. We base our analysis on the free-electron model, in which we assume that the conduction electrons in the metal are free to move throughout the volume of a sample, like the molecules of a gas in a closed container. 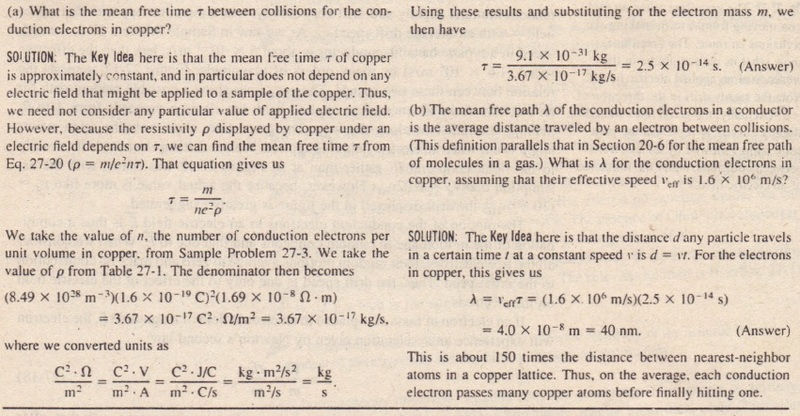 We also assume that the electrons collide not with one another but only with atoms of the metal. According to classical physics, he electrons should have a Maxwellian speed distribution somewhat like that of the molecules in a gas. 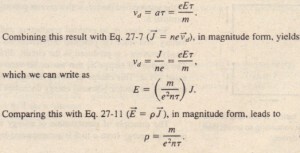 In such a distribution (see Section 20-7), the average electron speed would be proportional to the square root of the absolute temperature. 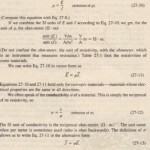 The motions of electrons are, however, governed not by the laws of classical physics but by those of quantum physics. As it turns out, an . assumption that is much closer to the quantum reality is that conduction electrons i a metal move with a single effective speed very, and this speed is essentially independent of the temperature. For copper, Vera = 1.6 X 106 m/s. 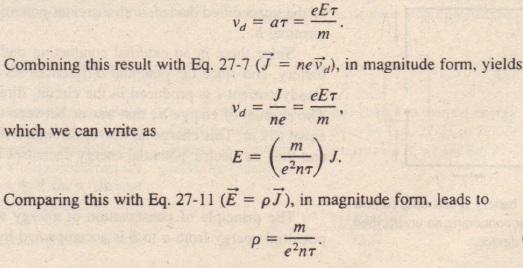 Equation 27-20 may be taken as a statement that metals obey Ohm’s law if we can show that, for metals, their resistivity p is a constant, independent of the strength of the applied electric field E. Because n, m, and e are constant, this reduces to convincing ourselves that ‘T. the average time (or mean free rime) between collisions, is a constant, independent of th~ strength of the applied electric field. 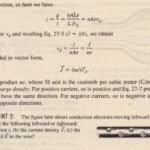 Indeed, ‘T can be considered to be a constant because the drift speed Vd caused by the field is so much smaller than the effective speed I’eff that the electron spell-and thus ‘T-is hardly affected by the field.